Somewhere between finishing the early season planting and wading through the huge main season dig, I start to ask myself, if it isn’t time to start reducing the size of the garden, so that there is less stress and effort and maybe more time to just enjoy the results. Then I rush off to sow the quick germinating seeds of Melons and Cucumbers and a couple of varieties of Morning Glories. They all need just a couple of weeks before they are ready to plant out and they are all heat lovers so they are happy to stay in the cold frame until the first week of June. I even found myself doing some new things, which means I’m expanding the garden not reducing it. If I just drill a few holes in the top of the eaves trough then I can tie some strings up there and let the Mandevilla cover the corner of the solarium all summer and it will be visible from inside and outside. My next big job is to install the drip irrigation system that is sitting in the garage. I bought it a couple of years ago but never got around to laying it out and setting it up for the main vegetable area. This year has been extremely dry so far and if that continues then it will be a big help. I’ve already run my sprinkler a couple of time this spring when we would have normally had more than enough rain. 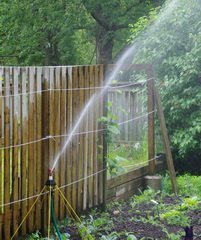 Sprinklers, of any type, are a very wasteful method of applying water to the garden. Much of what we throw up into the air evaporates before it has a chance to reach the earth and half of what does reach the ground doesn’t land anywhere near the plants that need it. With a well laid out drip system the target plants can get twice as much water while we use far less. The strange weather is doing interesting things to various type of plants. My tall bearded Iris, truly my favourite flower, are all starting to bloom. There are a large number of bloom stalks and the garden is going to be an absolute delight but I doubt if there will be many blooms left by the middle of June when the Iris show is scheduled. I really need to win back the “best Iris” trophy that I had to surrender last year. Competitive gardening really is a lot about luck. I can have the perfect bloom the day before and the day after the show while somebody else happens to get that perfect bloom on exactly the right day. All the skill and experience in the world cannot make up for the vagaries of Mother Nature. The upside of the early warm weather is the salads that we have already enjoyed from the garden. I took a chance during the strange heatwave in March and threw some seeds into the warm ground. 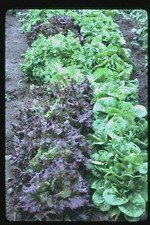 Lettuce and Spinach are abundant and there is one section behind the waterfall that always seems to have some self seeded Arugula growing and this spring is no exception. The perennial Lovage is storming ahead and adding its interesting celery-like flavour to all of these wonderful early salads. Garlic chives are becoming a bit of a weed but they are great in the salad dressing along with the abundant Mint and Oregano. Trying something quite new this year that I actually found in my local garden centre and had to pay for instead of getting some samples. A bright yellow Impatiens called Fusion Gold is a sterile hybrid of two Impatiens species. It apparently grows relatively tall for an Impatiens and does really like to be in the shade. It is a free flowering plant with bright yellow flowers that have a gold centre. 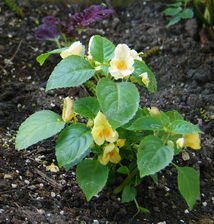 There are a couple of new seed varieties of yellow Impatiens that are available. I’ll keep you updated on how mine perform throughout the season. They were only available in 4" pots, which gave me a bit of an instant garden but obviously increased the price. I really do belong to the group that likes to buy it small and watch it grow. The other group, are those who want to have a garden but have minimal interest in growing one. Not everything is perfect in any garden, particularly mine. 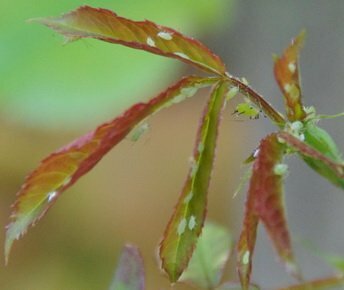 The Rose bushes that are much larger than most years, because of a lack of winter die back, are now providing even more room for the Aphids to move in. They are relatively easy to control. The trick is even noticing that they are there before they do too much damage. The quiet early morning walk around the garden, one of my favourite pastimes, is the time to look closely at things, both to appreciate the beauty of an unfurling Iris bloom and to notice the little horde of green bugs that are taking over the Rose bush. A little insecticidal soap or even a strong blast of water will deal with these nasty marauders. The secret is knowing that neither of these techniques has much residual effect and you will have to redo them a few times to keep the Aphids under control. Sharon Asks? I am trying to find out the proper name of an annual that I was given a few seeds of. I was told it was a "Himalayan Impatiens", and it spread by blooms 'spewing' seeds like one would spit out sunflower seed shells! It grows quite tall, about four feet, in many different colors. It was a curiosity, but really quite adorable in that it would show up here, there and everywhere in the garden. As you can tell, I'm NOT a fastidious gardener! If you happen to know how I could obtains some of these seeds, I would be very appreciative. Ken Answers! Impatiens glandulifera is native to the Himalaya region but is now widespread. 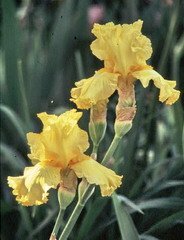 It thrives in damp conditions where the soil is regularly moist. It is considered a noxious invasive species in the U.K. where it is known as Policemen’s helmet because of the shape of the flowers. It will eject up to 800 seeds from its capsule when it is touched and that is obviously its primary distribution method. I have not done any research on seed availability but it shouldn’t be to hard to find. Just be careful where you release it. Danna Asks? Quick question - any advice on a good sprayer for fruit trees plus other garden goodies, but my real concern is fruit trees. I try to garden organically as possible. Many products are powder and need to be mixed. Some sprayers note that they do not work well with powders. I have been using a hose attached sprayer for years, but it seems to get clogged and I don't get proper coverage = bug eaten apples and peach buds = no fruit. Ken Answers! They all get clogged with mixed powders. Sprayers with adjustable nozzles can give you a bigger opening that doesn’t clog as readily but it is a much coarser spray with limited range. Try mixing your powders a few hours before you spray them and stirring occasionally to make sure they are well dissolved. A surfactant like a bit of dish soap will also help. June Asks? I have two Daphne shrubs. The older one is just starting to bloom beautifully... they really are a lovely shrub. The other still has 4 or 5 dead brown leaves on the end of all the branches. It looks like it is still going to bloom. ...... any idea why this is happening?? I think I will just snip the ends off. Do you think that would cause any problems? This is the first time this has happened. Ken Answers! If you are living in our part of the world then I would suspect that our weird weather was to blame. Many things started to grow in the very warm March weather and then the newly opening buds were damaged by the hard later frost.